A Guide To Trampoline Accident Claims – How Much Compensation Can I Claim? At Legal Expert, our panel of specialist personal injury solicitors can help people across the UK who have had a trampoline accident to make a trampoline accident claim. In recent years, trampolining has boomed as an activity for both children and adults in the UK. People are turning to trampolining as a convenient and fun health and fitness activity for themselves and their families, whether having a trampoline in the home, by visiting a trampoline park, or participating in organised exercises classes. According to the Royal Society for the Prevention of Accidents, (RoSPA), in 2014 more than 200,000 trampolines were sold across the country. Statistics also show that in the last three years more than 140 dedicated trampoline parks have opened across the country. If you or your child have been injured when trampolining, you may be able to make a personal injury claim. Talk to the dedicated injury claims team at Legal Expert today to see if you have a claim. Our guide below contains further information on trampoline accidents and how to make a trampoline accident claim. What Types Of Injuries Do People Suffer When Trampolining? Causes Of Accidents At Trampoline Parks And Gyms? What Should I Do If Someone Is Injured When Trampolining? Who Is Responsible For Trampoline Park Safety In The UK? Can I Make A Personal Injury Claim If I Have Signed A Waiver? How Much Compensation Can I Claim For A Trampoline Accident Claim? Why Choose Legal Expert For Your Trampoline Park Injuries Claim? Whilst for many individuals and families having a trampoline, visiting a trampoline park or participating in an exercise class is a fun and healthy activity, trampoline injuries statistics show that as the number of us using trampolines increases, so does the number of trampoline injuries. Home trampoline accidents statistics and trampoline park safety statistics show that in the twelve months to April 2016, ambulances were called to trampoline parks 315 times. Trampoline accident statistics also show that since 2014, over 6,000 people across the UK have reported trampoline injuries in the UK. 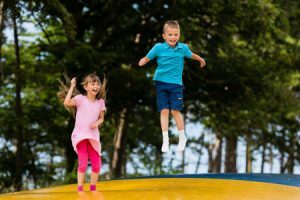 As the popularity of trampolining and trampoline parks increases, it is expected that trampoline injury statistics will also rise, putting further strain on the NHS. As with many forms of exercise, trampoline injuries can range from the mild to the severe. Due to the nature of the activity, they can very often be serious, such as trampoline back injuries which can lead to lasting consequences. Whilst trampolining is generally a fun activity for children, it is easy for a no-fault accident to happen. Some of these will involve minor scrapes and bumps, bad trampoline accidents will involve serious injuries. People can make a trampoline accident claim whether the trampoline is privately owned, hired or used in a public space (such as a park or exercise class). It is also possible to make claims against the trampoline manufacturer or the supervising adult/ operator. Across the country accident and emergency departments have seen a consistent rise in home and trampoline park accidents. 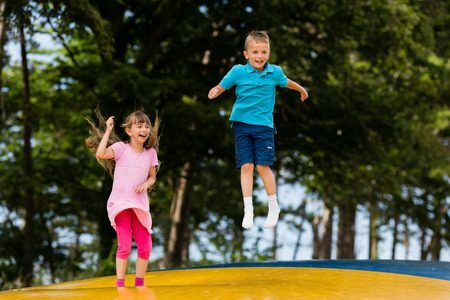 Figures produced by RoSPA suggest that as many as half of all injuries in the home for children under 14 resulting in a hospital admission were caused by trampoline injuries. RoSPA statistics suggest that trampolining is more likely to injure a child than other common activities, such as playing football, rollerblading or skateboarding. Part of the problem identified with using trampolines as a child, or adult, is that trampolines which were intended to be used by children are increasingly used by adults. Often injuries and accidents can be caused when adults and children are trampolining together. When the adult has bounced on the trampoline and it is rising, as the smaller child is coming down to meet it, the impact can be the same as jumping out for a first-floor window. 60% of trampoline injuries in the UK occur when more than one person is using the trampoline at the same time. The lighter person is five times more likely to get injured. Accidents can also happen when there is a safety net in place. Trampoline accidents with a net can be caused by parents or supervising adults being complacent due to the safety net. Trampoline park safety shows that some parks, such as a park in Stoke have much higher injury rates than others. Before visiting a trampoline park, check their trampoline park safety statistics. Whilst serious injuries, such as a fractured neck or spinal injuries are not too common. In the most serious cases, trampoline accident claims can involve life-changing or even life-threatening injuries. In trampoline exercise classes or parks, injuries can happen when people collide or fall into each other. In the home, trampoline injury claims can be caused in a variety of ways. Despite guidelines issued by manufacturers and advice from the Royal Society for the Prevention of Accidents, 60% of trampoline injuries suffered at home are caused by more than one person bouncing at the same time. Lots of people bouncing around at the same time can cause people to bounce into each other, suffering collision injuries. When a larger person, such as an adult is also bouncing they may even bounce the child off the trampoline. Trampoline accidents with a net do still occur. Whilst safety netting may be in place it might not stop the child from bouncing off. Trampoline back injuries, such as those leading to a trampoline broken back or neck can be some of the most serious suffered. The UK’s Spinal Injuries Association estimates that each year it supports four to six people across the country with spinal cord injuries which were sustained on a trampoline. Trampoline broken back injuries leading to a damaged spinal cord can even result in paralysis. Trampoline injuries to the cervical spine can affect every part of a person’s health. Generally, those suffering trampoline back injuries are men aged between 20 and 45 who fall onto or off the trampoline and land in an awkward way. Less serious trampoline back injuries can lead to muscle strains and sprains. Whilst muscle strains are less serious, they can be extremely painful and lead to long-term problems for the victim. These types of injuries can often be best treated by chiropractors with long-term care. Typically sprains and muscle strains are suffered in the middle and lower back. This is because these muscles are working very hard to stabilize your body whilst jumping and landing. If you have had a trampoline back injury consult your doctor as soon as possible. Trampoline broken leg accidents and injuries can happen to the bones in the thigh, lower leg or even the foot. They can also include trampoline broken ankle injuries. A trampoline broken leg injury can be very serious and have a long-term effect on a person. A case study of a trampoline broken leg accident was that of a six-year-old child. The child was bouncing on a trampoline which had a zipped net on it. The accident occurred when the father was sitting on the side of the trampoline and the child was bouncing. The child bounced next to the adult and landed awkwardly. This resulted in the child breaking one of their legs both above and below the knee. The child was left with an L-shape cast on the leg, allowing both breaks to heal. Broken leg injuries are the most common types of injuries sustained on a trampoline. If you have had a broken leg when trampolining, Legal Expert can help you make a trampoline accident claim. Whilst fun, trampolining is a potentially dangerous exercise and activity trampoline park injuries do happen. Over time, trampoline park safety in the UK has improved with increases in health and safety protocols and the introduction of new health and safety processes. The Association of Trampoline Parks has produced a set of guidelines which are designed to help trampoline parks to make their spaces safer to use. Until recently there were fewer minimum specifications on things such as the number of stewards who should be on duty as well as regulations on specific safety features and procedures. Accidents are generally caused by the same things as home trampoline accidents. These can be collisions, multiple people bouncing in the same area and people jumping off the trampoline. If you or someone you are with is injured when trampolining at home, at a friends home, in an exercise class or trampoline park there are steps you should take. Initially, don’t move the injured person. If they have landed on their back or neck in an awkward way they may have a back or neck injury. The St John Ambulance has a guide for what to do if you think a person has a spinal injury. No matter the injury type, seek medical attention straight away. When you seek medical attention make sure to get a copy of the medical report. This might be useful for a personal injury claim. Next, notify the provider or owner of the trampoline. If it is a class or a park ensure the accident and injuries are recorded in their accident report book. Gather as much evidence of the accident as you can. This means getting details of witnesses, taking photos of the injury and the condition of the trampoline as well as any safety notifications you have had prior to using the trampoline. Finally, once you have sought medical attention, talk to a solicitor. To make a successful personal injury claim, you will need an experienced solicitor. Ensure that users are prepared for using the trampoline and are in an adequate mental and physical condition to use the trampoline. Have provided correct training in using the trampoline. Customers at trampoline parks and in classes also have a duty of care to themselves and to others using the facilities. Customers should ensure they use equipment in the directed ways and avoid any unnecessary risks. Park owners duty of care stipulates that they must show customers how to correctly use equipment, along with the health and safety risks of not doing so. They also have a duty of care to regularly check equipment and maintain it in the correct way. Anyone with a home trampoline also has a duty of care to ensure it is safe to use. When this duty of care is breached in some way, the injured party could be able to a personal injury claim. According to statistics produced by the UK’s Health and Safety Executive, the most common type of workplace accident is a slip, trip or fall. When looking at the day-to-day activities of trampoline park employees or those running trampoline exercise classes, we can see that there is a high degree of having a slip, trip or fall on a trampoline. Due to their nature, these can result in much more serious injuries than other types of slips and trips in the workplace. As discussed above, workplaces have a duty of care to their employees to ensure that workplaces and equipment are in a good state of repair, and that they have provided employees with appropriate safety training and equipment. If you have had a trampoline accident at work, talk to Legal Expert today to start making your claim. Many gyms, exercise classes and businesses such as trampoline parks require participants or members to sign a waiver before being able to join the class or use the trampoline park. However, signing a waiver does not necessarily mean that you have actually waived away your rights. Owners use waivers in an effort to get people to waive away a right to make a claim for any injuries suffered. Most people will sign them straight away as otherwise, they will not be able to join in. Whilst they may have a degree of legality in their own right. A waiver can not be used to shield an organiser from their liability and it can not always prevent an injured party making a personal injury claim. Under the Unfair Contract Terms Act, providers of an activity can not restrict or exclude liability for injury or death which has been caused by their negligence. If the trampoline park operator has in some way been negligent, you could be able to make a compensation claim for injuries sustained. Negligence can include things such as failing to inform customers of the correct health and safety actions and insufficient supervision of people using the trampoline(s), as well as poorly maintained equipment. When people have had a trampolining injury, solicitors are often asked by clients how much compensation they could expect to get for their trampoline accident claim. Whilst this is a reasonable question for people to ask it is not possible to provide clients with a definitive answer. When looking at the award a claimant may receive solicitors (and courts if a case progresses that far) will weight up the different facets of a case. Claim awards amounts are based on guidelines produced by the Judicial College. The table below is designed to serve as a guide to amounts people could be awarded. If your injury is not listed below don’t worry, these are just illustrative. Back Injury Minor £350 -£9,850 Injuries, including temporary damage to the back. May include short-term pain as result of injury. Back Injury Moderate £8,750 - £30,750 Damage to the back, which results in long-term and ongoing pain. Back Injury Severe £30,750 - £123,300 Back injuries including the loss of motor function or paralysis. Knee Injury Severe £53,000 - £73,125 Serious knee injury may include considerable pain and loss of function.There may be lengthy treatment, gross damage and the development of osteoarthritis. Knee Injury Moderate £11,275 - £19,900 Injuries may involve weakness or wasting of the joint, as well as torn cartliage. This can result in some instability or dislocation. Fractured Ankle(s) Moderate - Severe £10,300 - £53,100 Fractured ankles which can no longer support your weight. There may also be some swelling. Fractured Elbows Minor £3,100 - £9,750 Fractured elbows can cause some stiffness and weakness in the arm(s). Fractured Elbows Moderate £11,400 - £23,900 Elbow fractures can cause damage to the arm as a whole as well as much reduced function. Fractured Feet Minor £5,300 - £11,050 The foot is not able to support your weight. Claimant's may need to use a wheelchair. Fractured Tibia Moderate £21,750 - £104,100 A fractured tibia makes it difficult or impossible to walk around. The above table is not a complete list of all injuries which may be sustained when trampolining. To find out more, talk to the specialist legal solicitors at Legal Expert. We can provide help and advice on what you might be able to claim for and how much your claim could be worth. At Legal Expert, we can help you make your trampoline accident claim using a no win no fee agreement. The technical name for these is a ‘conditional fee agreement’. These contracts mean that your solicitor will work with you without charging any ongoing or upfront fees. Solicitors will work on your behalf to recover any compensation you are owed the agreement will set out what the solicitor will do and how they will be compensated. If a claim is successful, the solicitors fees (less than 25% of the total award) will be deducted from the compensation award. If the claims case is not successful, the solicitors will not make any charges to the claimant. The benefit of a no win no fee contract is that it protects those who may be vulnerable from additional financial pressures. To begin your personal injury case, talk to the specialists at Legal Expert today by calling 0800 073 8804. People who have had an injury which was not their fault choose to work with the specialist no win no fee solicitors at Legal Expert because of our experience and knowledge, as well as our excellent service. By choosing to work with the specialists at Legal Expert, you can benefit from our knowledge. The solicitors we work with will be able to review your claim and the basic details of your accident. They will also look at your injuries. From start to finish, we are on hand to support your recovery as well as getting you the compensation you deserve. Contact the professionals and Legal Expert today to start your compensation claim. Our dedicated and professional team will begin working to get you the compensation that you deserve. You can contact us by calling on 0800 073 8804. You can also fill in the contact form on this page, or please send us the outline of your case in an email. If you have had a slip trip or fall, use our guide to find out how much compensation you can claim today. Find out how to make a personal injury claim for a back injury. What can these claims contain and how do you go about making a claim.